AppKarma pays you for many activities like viewing videos, downloading apps, etc. And like most of the money-making apps, you will earn points. You can redeem your points for PayPal cash and other gift cards including Google Play, Amazon and Xbox. AppKarma is one of the highest paying apps & legit. Its Google Play rating is enough to prove that which is 4.7. And most of the user reviews are positive proving AppKarma meets their expectations. This app is available for both Android & iOS. First, Download AppKarma from here. And enter this AppKarma Referral Code: 'siter' (without quotes) to get 300 bonus karma points instantly. Like every app I review here at InfoSmush, in this appKarma review I'll tell you the ways available in this app to make money. The points you earn on AppKarma are called Karma Points. App offers are high paying and most earning opportunities are in this section. In this section, you can earn points by installing apps from play store. Each app offer has different conditions that need to be met for you to receive points. Like, in the offer shown below you need to install and share the app with a friend to receive the reward points. But App offers have a drawback. You can only earn points for the apps that you install for the first time. 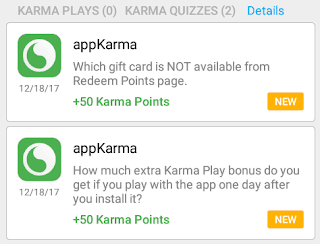 In addition to the points, you earn for installing apps you can earn more points through Karma Play, which we'll discuss later in this review. 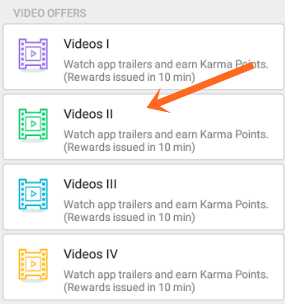 In this section, you can earn points by watching video ads. You will earn 1 point and sometimes 2 points per video. There are 5 video ads providers to choose from. I prefer the 2nd video provider (Videos II) because it takes less time to load videos and videos are always available. Another feature of video offers is that you can watch the ads for unlimited times and get paid for every time you view the ads. And by "unlimited" I mean literally. You can view video ads for as long and as many times as you want. There is no limit except one which I found out when I was viewing the ads while watching IND vs SRL match. I would just tap on the "Videos II" and let the ad play and once the ad would get over I would press the back button and again tap on the video provider. And repeat. Like this, I earned more than 50 points. But then I started getting a pop-up message saying that to view more videos I need to complete an app offer. I assumed it must be some kind of daily limit. So I tried to view videos the next day, but again the same message popped up. So I figured it was not a daily limit. AppKarma blocks you from viewing videos after you have viewed a large number of videos. That’s all the information they are willing to disclose. While we can’t know the exact limit of video ads my guess is it’s around 80-100 points because that’s how much I made on that day (since the day I installed AppKarma). This limit can be removed by completing an offer. 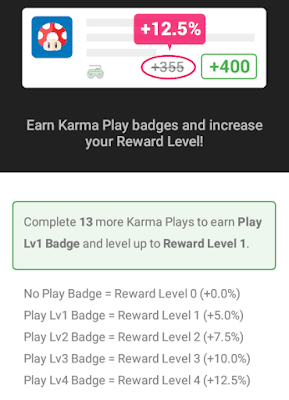 Karma Play lets you earn more points by using the apps that you have installed through AppKarma offers. Most apps come with Karma Play. 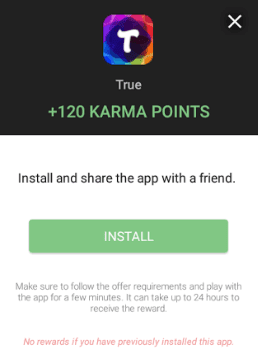 You can earn Karma points after 24 hours of the installation of the app. You download an app through AppKarma. Like I downloaded Wood Block Puzzle. Karma Play is available after 24 hours since the app was installed. Observe, in the above screenshot, that there are 2 karma plays and you will get 10-10 karma points for playing the game or using it for 4 minutes for the first and second time. This karma play bonus is available for 24 hours. And after you have claimed it, you can claim the rest 10 points after another 24 hours. Answer Karma Quizzes and earn 50 karma points per correct answer. You will earn 5 karma points for daily check-in. 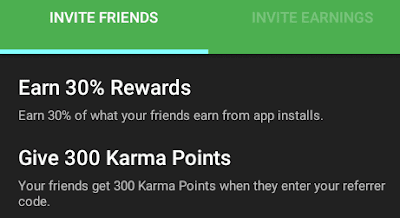 For every friend that enters your referral code you will earn 30% of their earnings and as a gift for being your referral, your friends will get 300 karma points when they enter your referral code. For example, when you enter this referrer code: "siter" you will get 300 Karma Points. AppKarma occasionally releases promo codes that worth between 50-700 points. But to claim them you need to complete offers and earn certain points. To know how many points you need to earn; enter the promo code. A message will pop-up saying that you need to earn at least ___ points claim the promo code. Promo codes are available until they all are gone or expired. You can redeem your points for PayPal cash, Amazon gift card, iTunes, Starbucks, Playstation store, Roblox, IMVU and many other gift cards. Yes. 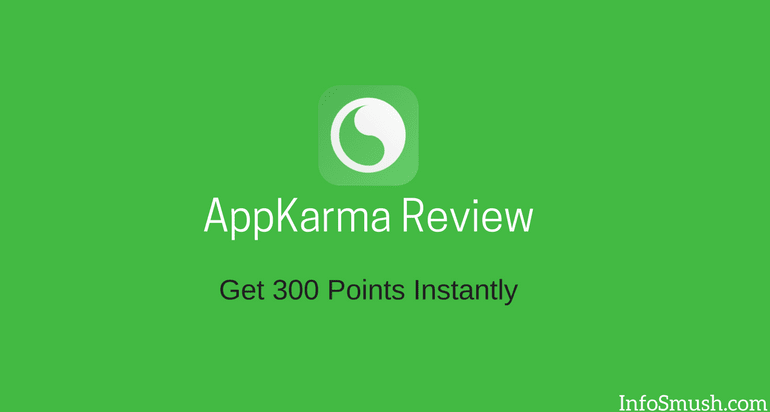 AppKarma is one of the legit apps, has the highest referral income(30%) and points can be redeemed for various rewards. But remember you won't get rich using this app nor will you earn hundreds of dollars a month. You will only earn extra cash ($2-10) depending on how much time you spend on AppKarma. AppKarma is really a good App. It might be time consuming, but it's good to earn some money rather than wasting time online... downloading apps and viewing advertisements are the easiest. I agree. Something is always better than nothing.